Lakeville Executive Suites: Get Your Office Out of the Basement! Whether you are starting up a new business, or have been at it for a while; Lakeville Executive Suites is a perfect solution for your new office. Often people believe that running an office out of the home is not only convenient but cost efficient. In reality the amount of time and money that is required to set up a truly functional home office ends up being more expensive then renting an office at Lakeville Executive Suites. Your home office may need a computer system, office furniture, fax machines and copiers, office equipment and supplies. This initial start up cost can be rather substantial. There is also the perception that a home office can function just as well as a traditional office space. This may be true for some. however; those who need to meet with clients or colleagues often find themselves looking for the closest coffee shop to avoid having a client at your home. Home offices often lack the privacy a person needs to complete a successful day of business. Personal phone calls, kids home from school, laundry pilling up - are all things that end up distracting you from success. Some people believe they are more productive at home then working in a traditional office space. But the reality is the office must be cleaned, faxes must be sent, equipment must be serviced and office supplies ordered. These mundane tasks which are normally handled by a support staff can seriously limit productivity and cause stress and frustration. The two biggest cons of a home office is the lack of peer interaction as well as the fact that their is no escaping the office. Being disconnected from colleges can leave you a step behind in a fast paced business world. Not to mention that if the office is always a present factor in your life, many people find themselves working 24/7 without any down. Lakeville Executive Suites can solve all of these problems with a simple lease. You won't need find office space, upfront cost of furniture, equipment, copy machine, or phones. It is all included for you in our low monthly rate. No longer do you need to fear if the front hall is cluttered with your two-year olds toys. 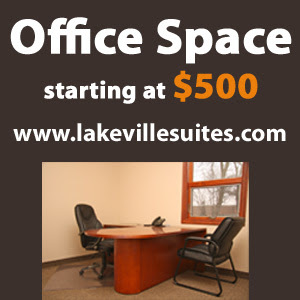 Lakeville Executive Suites offers a professional business environment for your clients. With two conference rooms you can meet with one client or twenty. No more wasting time worrying about supplies, Lakeville Executive Suites has everything stocked and ready for your use as well as a staff that is here to help you with your administrative needs. When the numbers all add up we can save you up to 60% of operational costs, not to mention that you are in a professional business environment taking your business to the next level.